Maintain the historic structures and cultural resources on East Brother Island in perpetuity, maximize public visitation and provide historical and educational information to the public. East Brother Light Station is a historic, victorian lighthouse in the San Francisco Bay, operated as a non-profit Dinner, Bed & Breakfast. 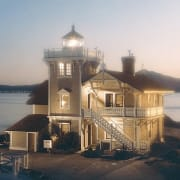 Would you recommend EAST BROTHER LIGHT STATION INC?